Working in water logged area is very problematic where sometimes even experts cannot achieve the good quality of construction work. Many engineers/contractors face the problem of water logging during the execution of construction work. Knowledge of different methods of dewatering and by knowing right procedure of installation of dewatering system, we can achieve good quality of construction work. There are different types of dewatering methods which are used to remove water from water logged ground. I.e. dewatering can be done by constructing the drains, by constructing deep wells, by freezing process, by soil stabilization with different chemicals, by well point system, by constructing sand grains, and by electro-osmosis method. Out of them, dewatering by well point system is one of the best logical and economical method. Generally, well point system is used to lower the ground water table up to 6 m or less. In well point system, the water is generally lifted by difference between ambient air pressure and the lowered pressure created by the pump. This system is more effective under most soil and hydrologic conditions. Also Read: What Should be the Minimum Depth of Foundation for New Home? The well point consists of a perforated pipe about 120 cm length and 4 cm diameter. This pipe has a ball-valve to regulate the flow of water and a screen to prevent the mud from entering into the pipe. The well point is connected to 5 to 7.5 cm diameter pipe which is known as riser pipe. The rise pipe is sunk into the ground by jetting the water at the rate of 20 to 25 litres per second. In this jetting process, the water jet dislodges the surrounding soil and enables the well point to be sunk down to the desired depth. After the well point has been sunk to the required depth, the water jet is allowed to run. This process continues till return water from the hole is quite clean. The water jet ensures washing all sand or silt out of the hole. The jetting action of water forms annular space around the well point. The coarse sand and gravels are filled into annular space to form the filter zone around well point. The filter zone prevents entry of fine particles of the surrounding soil into the well point. It avoids clogging of well point screen. The filter sand around the well point should be filled up to the level of water table. Then the tamped clay is to be filled up to the depth of hole above water table. The tamped clay acts as a seal and it prevents air getting into the well point through the sand filter. In typical well point system, the well points are placed at interval of 1 to 3m center to center. The well points are placed in such a way that it encloses the whole excavated area. The well points are connected to riser pipes and riser pipes are connected to a header pipe. Finally, the header pipe is connected to a high capacity suction pump. After setup, the suction pump is put into operation. Due to suction of suction pump, the ball valve in the well point gets closed and the ground water is drawn in through the well point screen. The water from the well point is sucked up through the riser pipes and header pipe and is finally discharged away from the site. Installation of well point system depends on soil-subgrade. i.e. if soil is uniform, the well points are required only on the one side. If clay layer is found above the sub grade, sand drains are required on opposite side to handle perched water. If clay is found below the sub grade, well points are required on all sides of pit or trench. 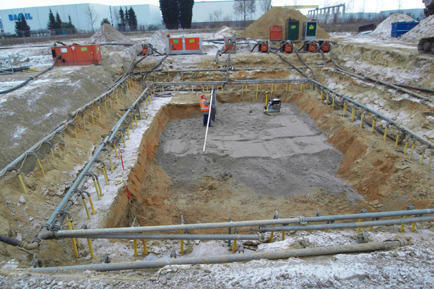 Well point system can be successfully implemented for depth of excavation up to 18m. Since the suction pump is normally not used to lift water above 6m depth, in deep excavations, where it is necessary to lower water table to a greater depth, multi-stage system of well point is used. Must Read: How to do Foundation in Water-logged area? Previous PostPrevious Smart Homes: 10+ Benefits of Home Automation Technology!